When we eat fat protein and carbohydrates we feel full. There is no such control for fructose, you can eat as much sugar as you can get into your mouth and it will never fill you up. 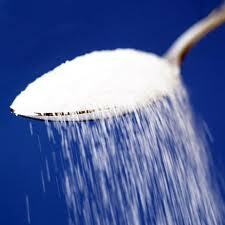 The more we sugar eat, the more we crave – not only sugar but other foods too. If you eat foods with sugar in them, you are going to get fat, but it is the much more insidious thing that is much more dangerous – it makes you immediately a candidate for Type 2 Diabetes, for heart disease and for a range of cancers that have been directly linked to sugar. In the 19th Century, our diet included about 1 kilo of sugar a year – in fruit, when it was in season. Now, with supermarket shelves laden with sugared foods and drinks, we consume on average 50 kilograms a year of sugar.Our calorie intake has increased 30% since the 1980s. Fruit juice is a sugar shocker, full of fructose. A glass of apple juice equals 4 apples; orange juice, 4 oranges. It contains exactly the same amount of sugar as a soft drink, as coke – that’s eleven teaspoons of sugar – eleven in apple juice. As soon as you finish the glass of apple juice you have in the morning, the first mouthful has already been converted into fat in your bloodstream. It is much better to have the whole fruit rather than the juice of the fruit. When you juice a fruit, you throw away the fibre and keep the sugar so you are keeping the worst aspect of the thing and throwing away the best. Low fat foods are usually high in sugars and salt. Most BBQ sauces, 55% sugar; plain tomato sauce 21% sugar; tomato paste 11% sugar; chilli capsicum spread 12% sugar; mayonnaise 20 – 25% sugar; ice-teas, this container has 10 teaspoons of sugar alone; sesame poppy crackers for your cheese almost 10% sugar; and most jams 60 – 70% sugar. A lot of people say you shouldn’t eat Coco pops because they’re full of sugar but they are about the same sugar as supposedly healthy cereals. And All Bran actually contains 13% sugar. Muesli? They have plenty of dried fruit in them which has fructose in it as well, so that will put on weight. Low Glycaemic Index foods are slowly converted to glucose in the body thereby, helping weight control. Processed or not, sugar is bad for us. It doesn’t matter if it’s plain white sugar, brown sugar, raw sugar or castor sugar; they are all exactly the same – all fructose. So what’s OK for sweetness? Have a really dark chocolate 70% – 80% cocoa has a lot less sugar. If you are going to eat cereal, have Weetbix, very low in sugar. Most alcohols are fine, It’s the mixes put with the alcohol that are the problem.